If you were a child of the '90s, or had a brother or sister who was, then you undoubtedly remember the phenomena that was Gak and Floam from Nickelodeon. Since the '80s were more my thing, I can't say that I ever remember playing with either compound when I was a child, though I do remember watching the television show, "Double Dare", which seemed to feature Gak in almost every challenge. Years later, Gak and Floam are back again, reformulated and supposedly better than ever. I knew my daughter would LOVE to help me review these two new toys, so keep reading to learn more about these highly popular substances and what we thought of each! 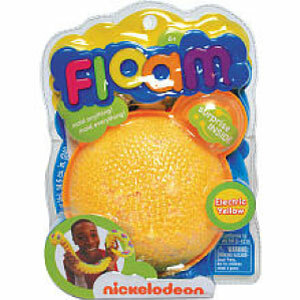 I reviewed the Gak and Floam from Nickelodeon, which retail for $6.99 each and come in a variety of colors. Completely reformulated to make playtime and cleanup a cinch for a new generation of families, Nickelodeon Floam and Gak are two unique reusable compounds,each designed to encourage creative expression and open-ended play. Perfect for both girls and boys ages six-years-old and up, new Nickelodeon Floam is a texturized molding compound, while new Nickelodeon Gak is a stretchy and squishy collectible goo. Available in Rockin' Red, Blazin' Blue, Electric Yellow, Glimmer Green, Posh Pink and Purple Power, Nickelodeon Floam can be squeezed, squashed and molded for hours of sculpting play. The innovative formula will keep kids engaged and allow them to create sculptures and finished projects they can be proud of. When playtime is over, Floam can be squished back into its airtight container for reuse or kids can let their creations harden overnight so they can be kept forever as a work of art. 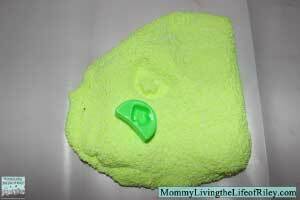 To play with Floam for the first time, simply remove the compound from its package and knead, stretch and fold it until it's soft, flexible and mixed well (for a few minutes). Floam will not stain, however it is recommended to prep a brand new package of Floam on a clean, dry surface and away from carpeting, fabrics and hair. 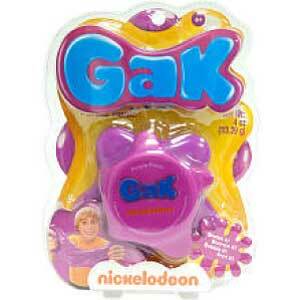 Once kids pick up Nickelodeon Gak, they won't want to put it down! 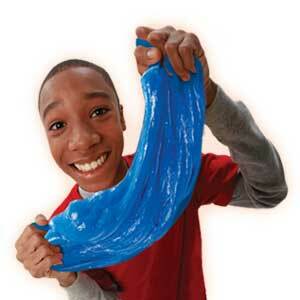 This squishy, rubbery compound can be stretched, squeezed, twisted, and more – Gak provides hours of silly amusement for kids, thanks to its unusual texture and elasticity, as well as its unique ability to be blown into giant Gak bubbles and make wacky Gak sounds. 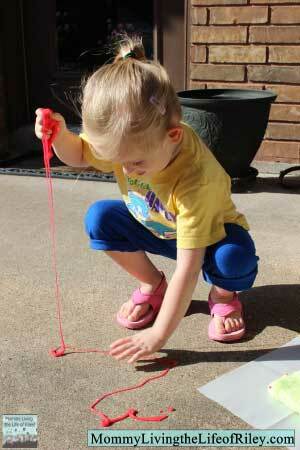 I prepared both the Floam and Gak as directed and kneaded each for several minutes. The Floam came together quite easily and required very little prep time. The Gak, on the other hand, was still messy even after kneading it for well over 5 minutes, as shown on my hand in the picture above. 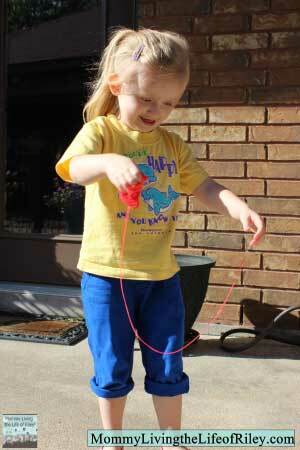 I would have let my daughter play with the Floam inside, but the Gak was proving to be quite messy and so I told Riley that we would be playing with these compounds outside. Boy, am I glad we did. As you can see from the pictures above, the Gak would go everywhere and it wasn't long before my daughter's hands were covered in it and she was flinging it all over the yard. You can also see the large smile on her face as she did this, for she was having a blast! The Floam was a lot more tame and definitely best for modeling characters of any shape and size. 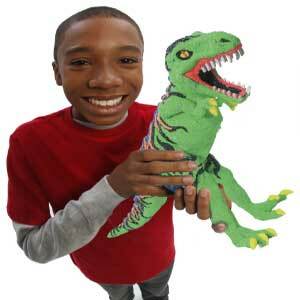 It's a great medium for your child to use to express themselves and will provide plenty of fun. 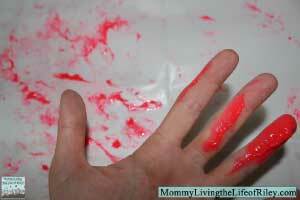 The Gak on the other hand, is strictly for being messy and gross and is a lot of fun too. Disclosure: I received several colors of both Gak and Floam from Nickelodeon and Team Mom in order to facilitate my review. No other compensation was received. This product review is based on my own personal experiences with this item and is completely honest and objective.